I remember MANELS ever since I was a kid. I think their store at SM North Edsa has been intact ever since time immemorial! As far as I remember, Manels has always been the store that is known for its good quality leather goods -- the type where your parents go to buy their shoes and bag staples. I don't remember personally buying there until like a year or two ago. I was passing by a MANELS store and they had a sale very much like what Manels is having right now! I was looking at the sales rack when I saw this darling shoes! I remember buying it for a steal! Like only 599 pesos? AND YES, its still alive and wearable up til today! I love the color (PURPLE for the win yeah!) and the fact that despite its high heel (lol obviously not a huge fan of super high heels! ), I can still wear it and pull it off. A rare feat I tell you. I wore it during one of the graduations of our school where I was the emcee. Nice noh? Napansin din ng sobra ng mga students ko! It was my first introduction to Manel's "CATCH" line. So I was thrilled when I found out that MANELS was having a sale thanks to Mr. Mark Siggaout, owner and VP of Operation of Manels. I dropped by their store at SM North Edsa with Jen the previous weekend and already had a sneak preview of some of the stuff that they are selling. And so I knew that if I wanted to grab a cool and chic Manels shoes, NOW was the time. Just by looking at their new trendy "Catch"shoes, I'm sure it will surely "catch" the new generation of Pinay fashionistas and trendsetters out there. 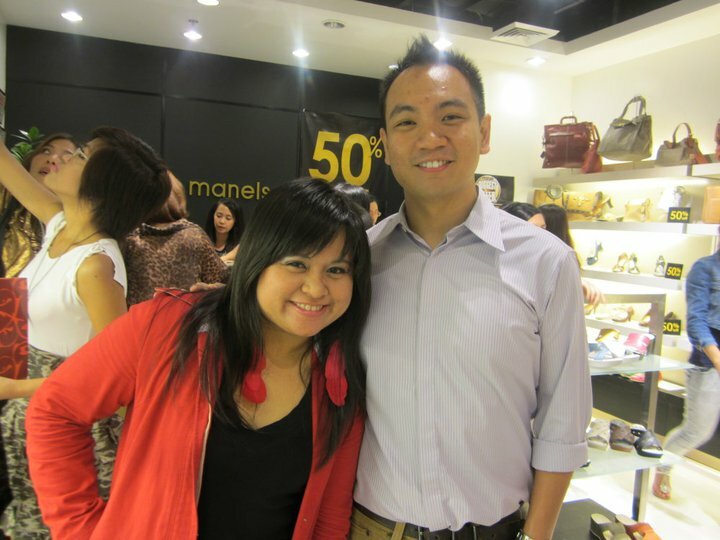 So last Monday, I finally was able to visit the brand "new" Manels SM Megamall Branch. New because it just had a facelift. Its now more chic with its bright pink for Catch (women's line) and bright blue (men's line) for Maphisto interior. This is what greeted us at Manels Branch at Megamall Entrance! Tweeting/texting people that I'm here at MANELS Mega! Of course, I had lots of fun taking photos of the loads of MANELS shoes and trying them out. I also had a dilemma on whether I should get a pair of shoes or a bag. I really wanted a bag! Since it was Manels, I knew it was good quality leather. So I really considered getting a bag. Seeing all their bags on SALE at 50% off made me salivate! I WANT! 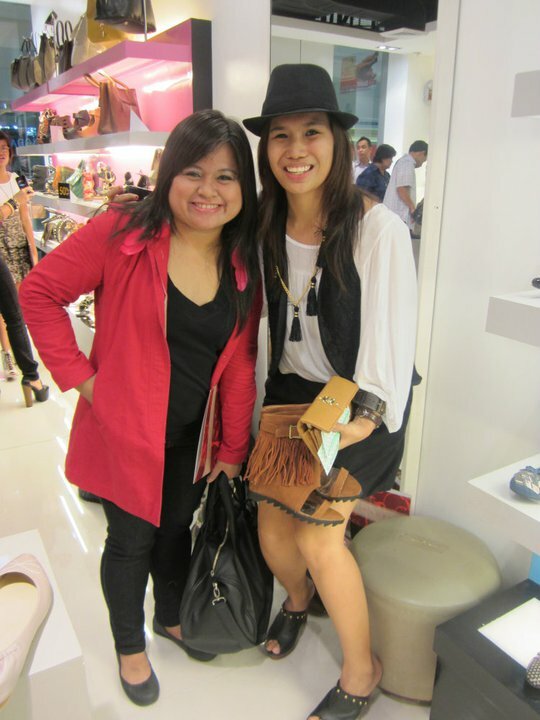 But then, all those pretty and fierce shoes started calling out to me! Then seeing my bffs choosing their fave Manels shoes got me thinking, and of course they started convincing me to get the shoes first. 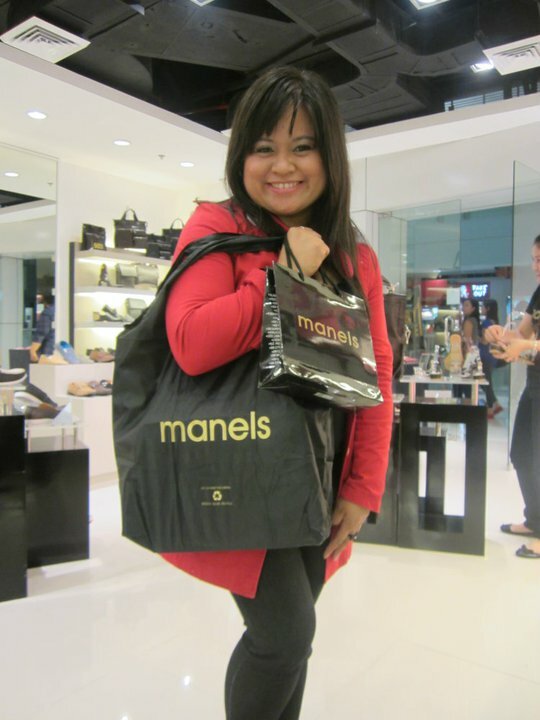 I already previously posted about the shoes and bags which I liked very much at Manels. 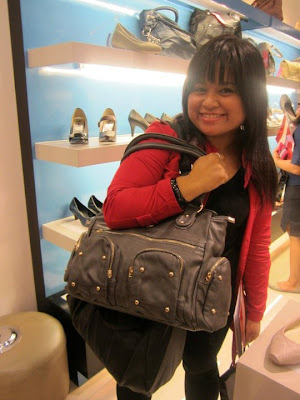 You can check them out at just click this Manels Shoes and Bags post. So hence my dilemma, SHOES or BAG? If you are my twitter follower you probably know alreadyt. If not, FOLLOW ME! 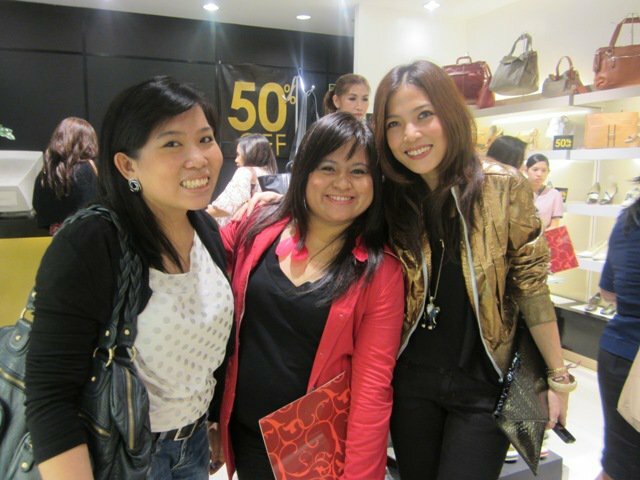 Saw MELAI from Style and Soul. Met her at a previous event. :) She's super friendly and nice! 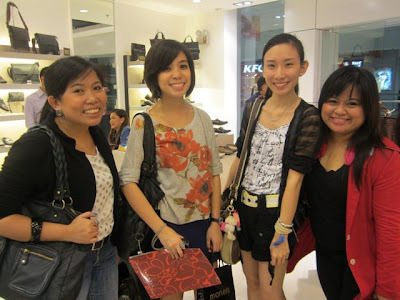 Amid the shopping frenzy and worrying over what to buy, I couldn't help but be pleasantly surprised with a lot of familiar faces -- bloggers whom I have only read and met online! It was really cool actually meeting, chatting, and seeing them all in person. 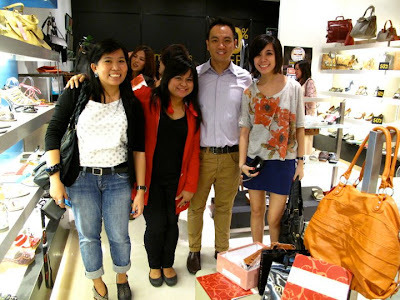 So while I was trying to deliberate whether to get shoes or a bag, I also grabbed the opportunity to meet, greet, and take a photo with some of the bloggers that I read and follow. Here are some of them! Bumped into EARTH again! 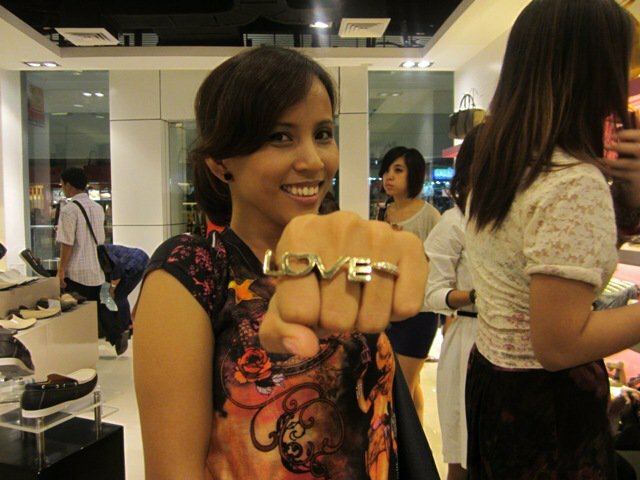 LOVE the ring. :) Pun intended! With AIE! Also met her in a previous bloggers event. Kulit ni Earth sa bg. FIERCE look! hehe. met with one of my fave bloggers, SARAH from Fashion Eggplant. Her JC's are memorable. Super awesome to meet her in person! Charles aka wickeRmoss and Sugar! Flashing awewsome Manels Flats! with AVA who started it all! The blogging adventures of us three! Later on I will probably share more on that! With Sir Mark Siggoaout of Manels! Thanks so much for inviting us! with my best friends JEN and RACHE with Sir Mark! Thank You MANELS! My PURCHASE was a success!!! LOVE IT! 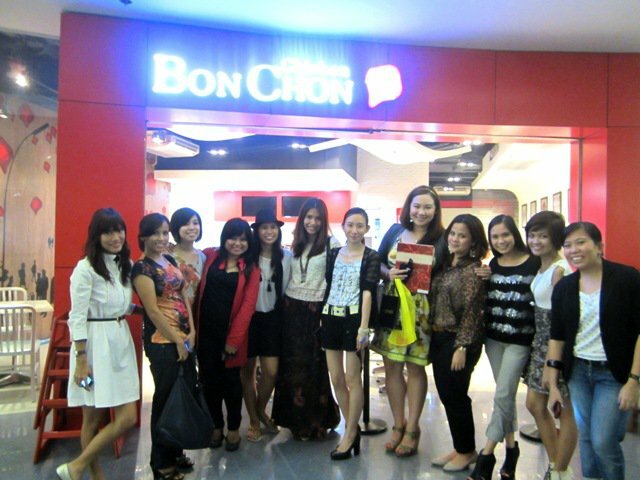 The evening ended with alomost all of us bloggers going to BON CHON at MEGAMALL for dinner. It was super fun, like a huge reunion party! Many thanks to Bon Chon for being patient with us even though we came in like almost closing time already. I personally didn't mind the wait. I was just happy to get my ration of Bon Chon! Here is a group photo with all the bloggers. P.S. So have you shopped for your MANELS shoes or bag already? 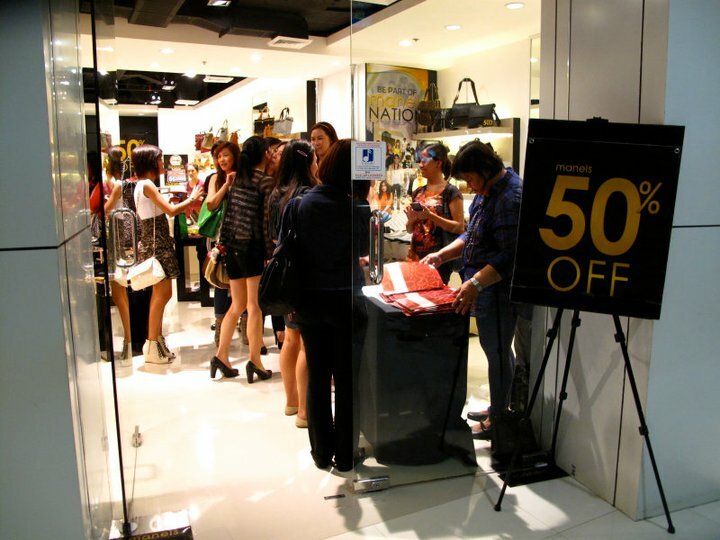 IF NOT, drop by any MANELS store right NOW while its still 50% OFF! Better yet, bring the whole family, relatives, barkada, and friends and if FIVE of you purchase an item at the same time, you can get up to 55% OFF! Isn't that fantastic? Hurry and don't miss your chance! Sale is only up to the 17th of July! P.S.S. I will post later on what I finally got at MANELS and my OOTD sometime tonight or tomorrow am. Watch out for it!